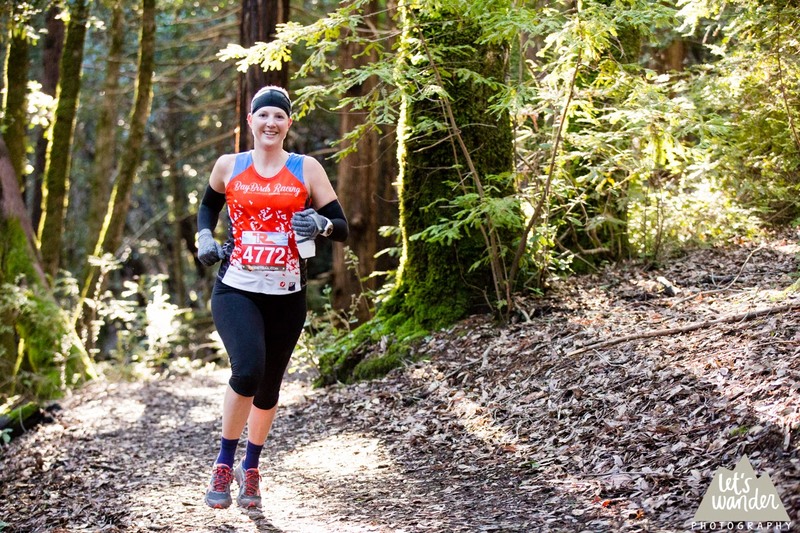 Last weekend, I ran the Woodside Ramble half marathon in Huddart Park, one of my favorite parks in the Bay Area. This was a fantastic end of year event with a sellout crowd, and we lucked out with chilly but good running weather. I originally planned to run the 35K, but as the race approached I didn't have the training base I wanted to do well at the longer distance. Instead of slogging along for 35K, I decided to switch to the half marathon and put more effort into the pace. The 50K and 35K started at 8 am, and the half marathon was set to begin at 8:30 am. Unfortunately, the traffic into the park became very bottle-necked due to the Huddart Park pay station and people had trouble getting there in time. We arrived at the park entrance line 50 minutes ahead of the race but only made it to the start at 8:20 due to the traffic situation. They ended up delaying the half start until 8:45 am due to this issue, which enabled many more people to get there in time. I applaud Inside Trail for how they handled the rough park entrance situation. I've run in this area quite a bit, including the Woodside Crossover 50K earlier this year, so I know the trails well. 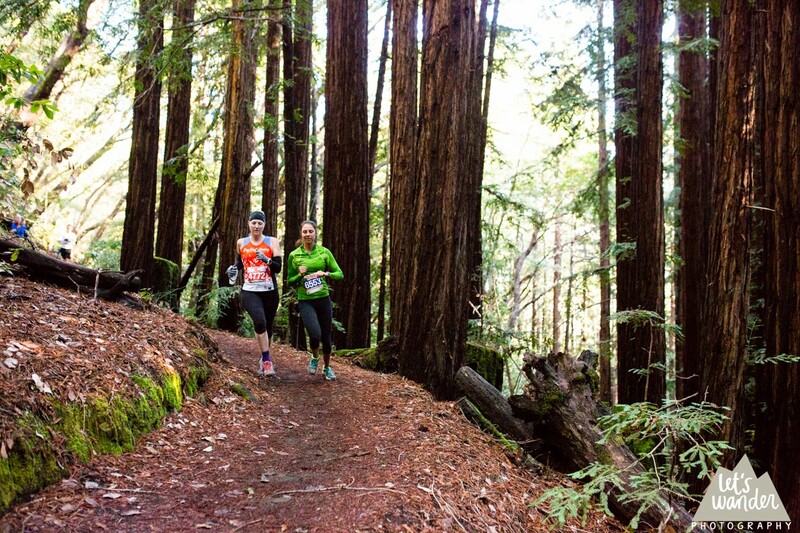 I love running in the redwood tree cover! This race started at the Werder picnic shelter, headed downhill on the Bay Tree trail, then turned left to follow Richards Road (a fire road) to begin the climb. I rolled my right ankle very hard on that left turn; the sharp pain freaked me out for a minute or so but then seemed to subside, so I kept going. We started climbing, and my quads and calves immediately complained. I had taken a barre class two days before that resulted in major quad soreness, so every use of the muscle hurt. I'll think twice before I make that mistake again! The calf cramping is somewhat standard for me in situations with early climbing, so that wasn't surprising but was extra painful that morning. I pushed forward the best I could, stopped a couple of times to stretch the calves, and made the best of it. The situation wasn't helping my goal of pushing pace though. Finally, a little after mile 4, my calves opened up. I was thrilled to feel better and even started to pass some people on last part of the climb. Shortly after mile 5 the climb ended and we did an out-and-back along Skyline trail, then we headed downhill for a couple of miles on Chinquapin trail. I absolutely love running on that section of trail! We turned left onto Dean and had another short uphill where I was able to push myself harder now that my body was warm. I continued to pass more people which boosted my mental state too. The last few miles of the race were downhill with one last climb to the finish. I had picked up my pace after my calves felt better, so by this time I was definitely feeling it more than usual for a trail half marathon. I finished in 2:32:59 and was very happy with that time! I'm not completely convinced the course was 13.2 miles as Inside Trails has on their map, but even if it was short I feel good about my time and my effort. GPS tracking is notoriously bad in the Huddart tree cover, so the distances tracked by runners were all over the board. 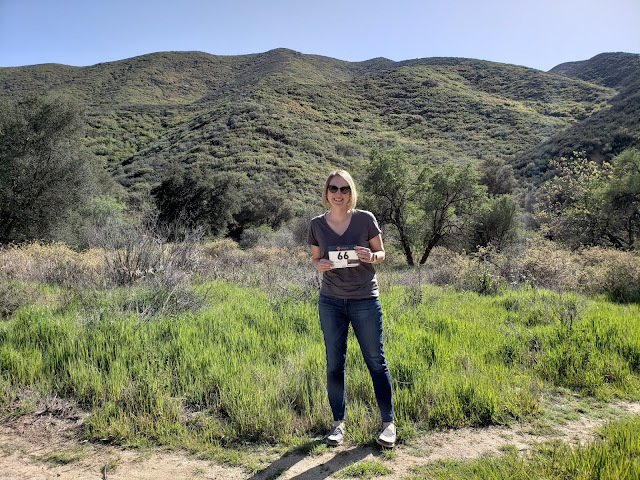 I think I would have done a little better without the constant quad soreness, but I told myself it's great mental practice for the end of a hard 50K where I'm wiped out and in pain. All in all, this is one of my faster trail half marathons (if not the fastest depending on how short it was) on a course with similar climb. What a great way to end my racing year! Course profile from the Inside Trail website. 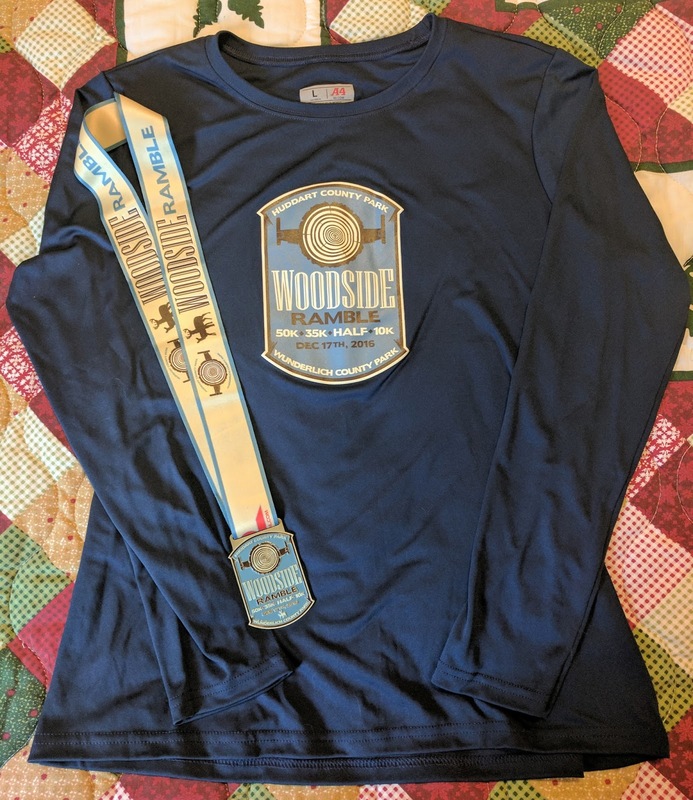 For swag, Inside Trail gave us nice long sleeve tech shirts and medals. They also provide the photos for free - this is my favorite perk of all. A huge thank you to Let's Wander Photography for the photos. The goods. Love the shirt color. In addition, it was wonderful to see many friends at the race or to hear of their awesome performances. We visited with Cat, Jen, and Margot before the race and briefly at brunch. Plus BayBird Rebecca won the 50K, and Oiselle Volée teammate Asher won the half marathon. Amazing performances, ladies! 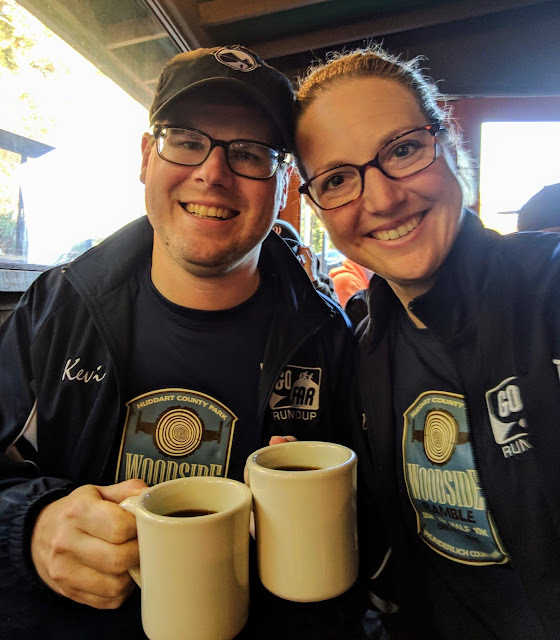 The one where married people match post-race outfits. Well, that ends my race year for 2016. I have exciting plans for 2017 to share soon - I can't wait! That stretch of Chinquapin is my favourite too. Lovely to see you!